Disco Fries are the production powerhouse behind the most innovative EDM coming out of NYC. Made up of Nick Ditri and Danny Boselovic, the pair release club-focused electronic music that walks the tightrope between mainstream and club-stream, proving both critically and commercially successful. Carving out a reputation as one of America’s hottest electronic musicians and most talented DJs, their music has been championed by some of the biggest names in dance: from artists like Diplo, Kaskade, Steve Aoki, and Hardwell to popular publications such as Billboard, Rolling Stone, MTV and Dancing Astronaut. 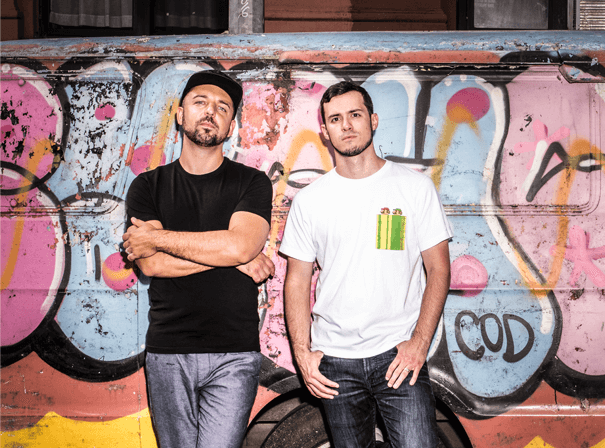 After forming their friendship at Berklee College of Music, Nick and Danny began producing electronic music under the moniker Disco Fries in 2011. Though they’ve received support from across the industry, one artist would set a course to success for Disco Fries: in 2013, dance music icon Tiesto debuted their track “Lose It” at Electric Zoo Festival. From that moment onward, the producer forged a creative relationship with the pair that has continued to this day. Their first collaboration, “iTrance”, was quickly followed by the Disco Fries’ first release on Tiesto’s record label, Musical Freedom. Inspired by Tiesto, the duo soon founded their own imprint, Liftoff Recordings. The label has since encompassed a radio show, several releases, and more while nurturing emerging talents from across the globe. As years progressed, Disco Fries’ discography saw exponential growth, with production and writing credits on Tiësto’s fifth studio album, which featured the hit single, “Wasted”, an instant success that became the producer’s first certified Platinum record in the US. Their debut EP, Autonomous, was released on their own label to wide acclaim, with the iconic Halogen Mix of “Born Ready” ft. Hope Murphy reaching over 11 million Spotify streams. The duo’s subsequent Liftoff Releases gained similar traction and have collectively received over 10 million streams. Their recent “DF EP” has been heavily rotated on nationwide radio, with follow-up single “U Make Me” hitting the top spot on SiriusXM BPM for three consecutive weeks and No 13 on the Billboard Dance Chart. With nearly half a million monthly listeners on streaming services, regular live performances across the globe, and a radio show that’s broadcast in over 35 markets worldwide, Disco Fries are always looking to push themselves even further.